Are you planning on using a live evergreen tree indoors for decorating? 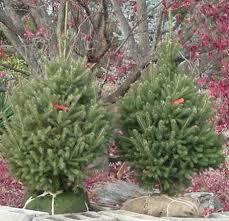 Live evergreen trees that will survive in zones 4-6 are Dwarf Alberta Spruces, Blue Spruce, Yews, and Arborvitaes. Pick a healthy tree that matures to a size appropriate for your yard. The root-ball should be firm and rounded. Before the ground freezes dig a hole for the tree as deep as its root-ball and twice as wide and fill it with straw or leaves. Bag up the soil and bring it inside to a basement or back hallway so it doesn’t freeze. To transition the tree from the outdoors to a warmer location, put it in a garage or unheated porch for a couple of days. Then, display the tree indoors in a room as cool as possible. Keep the root-ball evenly moist but not soggy, by placing the tree in a container with sand or gravel at the bottom for good drainage. Water the tree as needed. Turn the tree’s decorative lights on only when you are in the room. And, you can plant your Christmas tree outside after the holidays. Put the tree in the garage or porch for a few days before you plant in your yard so it won’t be shocked by moving it from the heated indoors to the freezing outdoors. Then remove the materials that were used to fasten the roots, loosen the roots a bit, and plant the tree in the prepared hole. Back fill the hole with the original bagged soil, packing it down. Put a six inch layer of mulch around the tree, leaving a few inches of bare ground circling the trunk. In the spring, fertilize the tree with Holly Tone and water well the first year.